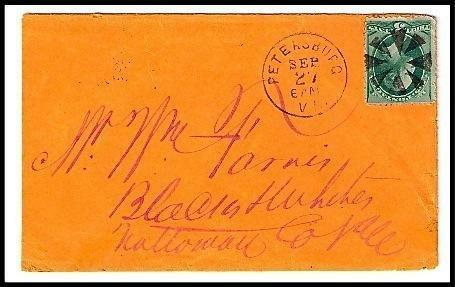 i000000 c1880 Petersburgh, VA Discontinued/Defunct Post Office (DPO) Postal Cover c1880 Petersburgh, VA Discontinued/Defunct Post Office (DPO) Postal Cover Description: Full cover with postmark on front from the discontinued-defunct Post Office (DPO) of Petersburgh, VA (Dinwiddie County) (existed 1794-1923). Post Office in existence for 129 years. Petersburgh is spelled with a "gh." Postmarked on September 27th. Burst cancellation. Letter sent to Mr. William Farnis in Blacks and Whites, VA. In fine condition, no major flaws. Will be sent in plastic protective sleeve. Thank you for your interest Click Images to Enlarge Shipping and handling (S H) - FREE SHIPPING for this item via USPS First Class or Parcel Post to addresses in the United States. - Internationally, please add 2 for S H costs.